Steviol glycosides based granular table top sweetener. 0 calories. Suitable for vegetarians.The sweet taste of Truvia®sweetener comes from an extract of the stevia leaf, a plant that's been enjoyed for its delicate sweetness for centuries. 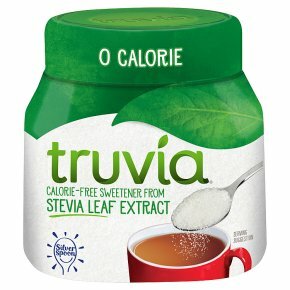 We take the best-tasting part of the stevia leaf and blend it with erythritol to give Truvia®sweetener a sugar-like texture and calorie-free sweetness.